Trick or Treat? Themed, or Traditional? Tom celebrates Halloween every year. Goblins, ghouls, monsters, costumes, and cocktails – what is there not to love about this festive holiday? However, Tom’s favorite part of Halloween is it’s liberating side-effect. It is the one day when you can break the “rules,” emboldening even the shyest, most modest people to bring out their personalities in a big way! And when it comes to weddings, Tom’s favorite part of planning is getting to know people on a personal level, with all quirks and idiosyncrasies intact. Uncovering these unique traits enhances his ability to accurately transform his clients’ dreams and Halloween fantasies into an ultimate wedding-day reality! He has noticed an unmistakable trend in recent years: A growing amount of themed weddings, and thereby, less traditional weddings. More and more, weddings are becoming a non-traditional cauldron-mix of ideas, and blended stew of cultures. We encourage in weddings what is encouraged in Halloween. Even if your wedding doesn’t occur on or near Halloween, weddings can still be planned and implemented in the same spirit (at your own risk!). Disregard dull and numbing stereotypes, and embrace your own shiny and eclectic passion, in whatever form or shape that may be! Leave expectations behind, and dress up as you like while encouraging your attendees to do the same! Maybe you love super heroes, or are a film fanatic- Your wedding can model after that passion. Similar to Halloween, the event of a wedding involves a person passing into another character – whether it’s Bridget to Betty-Boop, or Betty-Boop to Bride. Both events call for a free pass to be whoever you want to be! Your special day really can be as unique as your Halloween costume. Customize it to be as zany, creative, and off-beat as you want it to be! It’s yours’ for an entire day; a memory that you will cherish forever. And guaranteed, that memory will burn even more dramatically for your guests who are also getting in the spirit. into the ultimate cornfield. It was graveyard theme with an old school, gothic vibe. With the aid of dry ice, a smoldering smoke gave way to characterize dining tables as floating coffins. The attendees were surprised to be invited to sit at these floating coffins to eat. In a wedding event planned by Tom was asked to plan a “police officer” themed wedding. Every attendee was asked to dress as a police officer for the wedding. Directly after the wedding, the party moved to a “police bar” nearby and everyone cheered on any real police officer that entered. 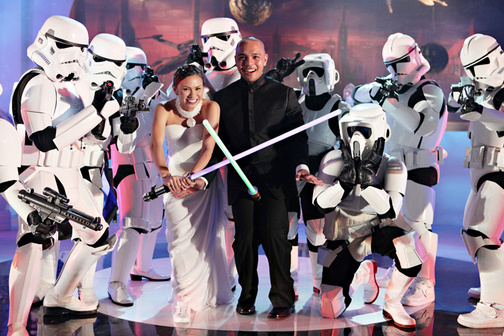 To some people, planning a “themed” wedding in this manner may seem unfathomable and even cringe-worthy. But for some, a themed wedding may be more authentic to them. We always say high-energy is key at events and costumes are great conversation starters. So whether you’re planning your Halloween costume or your wedding, have fun with it, don’t hold back, and embrace whatever your heart desires!